You are currently browsing the tag archive for the ‘Sanctuary Gasing’ tag. DBKL and the Minister of FT and Urban Wellbeing cares? From the various press reports, one might believe that safety of the residents adjacent to steep hill slope developments are of concern to the authorities of Kuala Lumpur. They should sleep easy when we have monsoon rains as like now. Let’s review what the residents next to steep hill slope developments have observed just this year. In March of this year, a landslip was recorded in this blog. For DBKL, there was no landslip, merely repairs to earthworks. Also during March, landslides and floods were recorded. Was there urgency to enforce safety regulations and alleviate the frustrations of KL residents by the Minister of FT and Urban Wellbeing? What this blog did not record out of frustration was a further landslip in May this year in the same area as the landslip in March. Yet, all the Mayor of KL could say now is that if there is a breach of safety regulations, a stop order will be issued. This blog recorded the landslip that occurred over last weekend. The photos are here to be seen. Is it possible that residents were having delusions of landslips when the developer was merely being diligent in covering the steep hill slopes that they cut to deter rain from seeping into the soil? Why only after the events captured here on this blog? Yes, one does need to put thinking cap on here. Are plastic sheeting now a DBKL approved method as a safety regulation? One might think it is as the Mayor claims no safety regulation has been breached. Frankly, we don’t feel we want a Medan Damansara incident to have the authorities review and provide reassurance of their care for our well being. If the Mayor of KL is sincere, please advise us what the safety regulations are and what the “IKRAM” (or the DBKL daily monitoring) standards are to make the development safe. This could all be done transparently in a public hearing. Highland Towers collapsed because of steep hill slope development next to it. It did not fall because of the towers themselves were unsafe. We are not the only residents near steep hill slopes fearing for their safety. Do read the Star article of 24th October 2012 . The fears of Bukit Bandaraya, Bangsar residents are just as real. Let’s not forget the plight of the resident in Section 10 of Wangsa Majo either. Please Mr. Mayor, we can’t all be deluded.. or can we? PS: Do click the highlighted links to read articles related to this blogpost. The panel of 5 Federal Court judges delivered a shocking and surprising decision to reject our leave for appeal on the Court of Appeal majority decision (2 to 1) against our Judicial Review application to require DBKL to hold a public hearing regarding approval of Gasing Meridian Sdn Bhd’s proposed development at Bukit Gasing (KL-Side). We had anticipated that the Federal Court would have allowed leave to hear our argument that the majority decision by the Court of Appeal has serious implications. The minority judgement in our favour was that the Town & Country Planning (Amendment) Act (2001), that was gazetted on 20 February 2002 by the then Minister of Housing and Local Government (Dato’ Seri Ong Ka Ting) is applicable to the Federal Territory of Kuala Lumpur. Hence, DBKL should not have approved developments on Bukit Gasing without giving a public hearing to residents. For more than 5 years, we have challenged DBKL and the developer through the courts. 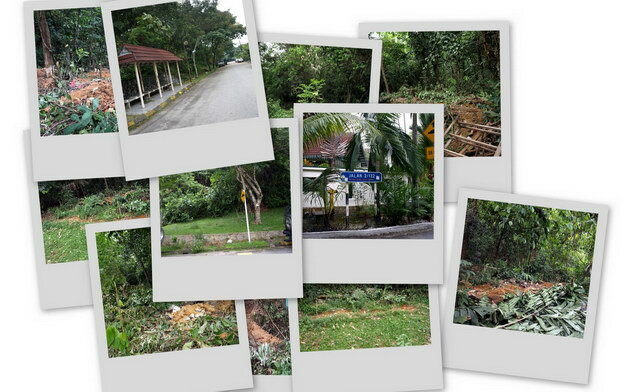 We have argued that as residents threatened by landslides by Gasing Meridian Sdn Bhd’s proposed development on the steep hill slopes of Bukit Gasing, we have to be given the right to a public hearing by DBKL. The Town & Country Planning (Amendment) Act 2001 (TPCA), passed by our Parliament and subsequently gazetted should have required DBKL to give us a public hearing. Despite our losing through a majority decision by the Court of Appeal in March 2012, we were heartened by the minority decision of Y.A. Dato’ Jeffery Tan. He strongly argued that the TPCA should apply and our right to public hearing be given. His considered opinion was that the Planning (Development) (Amendment) Rules 1994 instigated by DBKL and approved by the Minister then, to amend Rule 5 of Planning (Development) Rules 1970 should not be used to limit rights of residents to a public hearing before planning approval. In short, Y.A Dato’ Jeffery Tan argued that Rule 5 (after amendment in 1994) is a subsidiary legislation. In his view the general principle of statutory interpretation should be that subsidiary legislation may not be broader than the enabling legislation. Residents of KL do not have the same rights to a public hearing as other residents living outside of Kuala Lumpur in Peninsular Malaysia. Non-KL residents unfortunate enough to live next to land under DBKL will not have the same rights to a hearing under DBKL planning rules as he/she has within Selangor. Whilst the Parliament may have amended the Town & Country Planning Act to ensure the whole of Peninsular Malaysia (defined as including KL) is governed by the same regulations, DBKL can continue to limit the rights of people by utilizing Rule 5. Note: Rule 5 as used by DBKL means affected neighbours will have no right to be heard or informed if a development approval do not involve a change in density or use of land. We have tried to seek justice and transparency through the courts and have failed. However, we will continue to speak out and trust that the court of public opinion as well as public desire for elected mayors to ensure accountability and transparency will prevail. Should we continue to allow authorities to decide policies that negatively impact our rights? Should their unfeeling and uncaring attitudes continue unquestioned? It is time that we demand accountability from those that govern us. Let us not trust in platitudes and lies anymore. Despite the many disasters caused by irresponsible development on hill slopes and outrage voiced by many victims of irresponsible development, planning authorities seem to conduct their business very much as before. Bukit Gasing is again back in the news in recent days. The mayor of KL had made comments to The Star (dated 14th July 2010) wishing to gazette Bukit Gasing and talked about not allowing developments in Bukit Gasing. Upon closer examination, the proposal covered only 52.6 hectares out of 113 hectares of Bukit Gasing within its jurisdiction. The proposal seems to allow for all the developments set out in the Draft KL City Plan. Worst still, this is now less than the 54 hectares that was planned by DBKL in April 2006. DBKL appears to be on the verge of approving a development of two (2) 26 stories condominium in Bukit Gasing as well. This is not withstanding the fact the area where the proposed development was not even listed as for such a high density in the much disputed Draft KL City Plan. There were numerous objections submitted to DBKL regarding the Draft KL City Plan tabled in May 2008. The decision of the Hearing Committee for the draft KL City Plan has yet to be made public. As if competing for a new 1Malaysia “NKRA”, 91 plots of land on steep and unstable slopes of Bukit Gasing along Jalan 5/60 is now up for sale by Petaling Gardens Sdn Bhd. The current attempt to spur property development (sic) on the section of Bukit Gasing where Sivan and Sri Maha Kaliamman temples are situated should sound alarm bells to both residents of PJ and potential buyers. Sri Maha Kaliamman was almost destroyed at end of May 2010 and Sivan Temple renovations/extensions resulted in a landslide in March 2008. Petaling Garden Sdn Bhd is part of I&P Group Sdn Bhd, whilst I&P Group Sdn Bhd is a wholly owned subsidiary of Permodalan Nasional Berhad. Isn’t it amazing that with such a prestigious lineage, no “health warning” was posted with the plot notices? Still, we hope that MBPJ (with the help of Councilor, Derek Fernandez) will exert the full force of planning controls before any building is approved and residents will be given a full public hearing. Then again, maybe well meaning buyers may wish to contribute to the “NKRA” by buying the plots and then leaving them as green lungs for PJ and KL residents. Most readers of this blog would have read about the many disasters caused by irresponsible developments on steep hill slopes across Malaysia. Yet, it seems time and time again approving authorities are unwilling to exert their planning responsibilities to ensure developments and controls are in place to ensure safe developments. Increasingly, DBKL seems determined to win the “Oscars” for the least concerned authority for environmental matters and the well being of its residents. Despite the many concerns raised by residents around Bukit Gasing and NGOs on the need to stop development on Bukit Gasing, there has been no real change. When will DBKL walk its talk about responsible development and preservation of scarce green lung and open spaces? Much has been said by some about land owners having the right to develop land they have purchased. Surely such rights must not to compromise the rights of the public to expect that developments will be safe for existing as well as future residents. It must be incumbent on approving authorities to ensure that developments are sustainable developments and are safe. 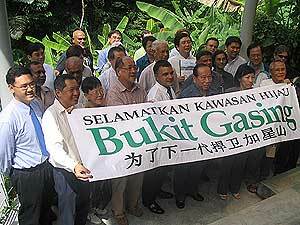 Residents affected by proposed development by Gasing Meridian Sdn Bhd will be at the KL High Courts to hear the High Court’s decision regarding the Judicial Review against DBKL for approving developments on Bukit Gasing on Monday 6th September 2010 (2:30pm). The proposed development is known as “Sanctuary Ridge”. The developer, in its efforts to sugar wrap the nature of its proposed development, has recently created “Community Happenings” at Bukit Gasing website. It is no more than a masquerade for presenting “Sanctuary Ridge” to potential buyers. According to Dr. Raffick (Bukit Antarabangsa blogger), there is yet more shenanigans afoot at Bukit Antarabangsa. “101 Guide to buy a house for dummies!” is a must read and yet another example of the “Malaysia Boleh” spirit of distortions and contortions of the mighty. It should be clear to all that being silent and passive will not make developers and authorities step up to responsible and sustainable development. We must continue the fight to regain our rights to have safe and sustainable developments in our nation. Note: Do click the links embedded in the writing above for more information. 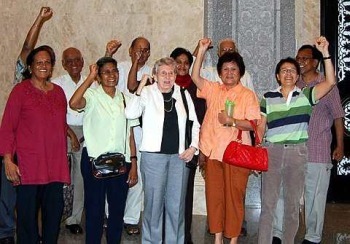 BUKIT Gasing residents triumphed 2-1 in a court appeal against the Kuala Lumpur City Hall (DBKL). The judge had ruled that DBKL’s appeal against the High Court decision granting leave to residents to challenge a development order on a hillslope project in Bukit Gasing was dismissed in court, said lawyers R. Sivarasa and Derek Fernandez, who represented the residents. As reported in StarMetro (“Ray of hope for Bukit Gasing folk”) on April 27, the High Court has granted the residents leave to proceed with an application to nullify the development order on a Bukit Gasing project issued on Oct 2, 2007 by the then Kuala Lumpur mayor Datuk Ab Hakim Borhan. Big day: Bukit Gasing residents rejoicing the appeal court’s decision. However, DBKL and the developer appealed to the Court of Appeal against the “leave” granted by the High Court, Joint Action Committee for Bukit Gasing (JACBG) committee member Victor Oorjitham said. “It took us nearly 20 months and attending several hearings in court before we were granted “leave” by the court,” said Victor. “Our stand is that no development of Bukit Gasing should be permitted because of the steep gradient on parts of the hill and unsuitable soil structure comprising sand and shale (compressed mud) and that if development was allowed, there would be landslides affecting the life and property of thousands of residents living close to the hill,” he said. The residents have been in constant battle for almost two years with the city council and the developer Gasing Meridien Sdn Bhd (GMSB) pertaining to the hillslope development in Bukit Gasing that would affect 108 residents. Maxwell Towers Joint Management Body (JMB) chairman Ashok Menon said this was a significant case for the country. “Today is one of the rare days where justice is delivered. This is a matter of safety. “We need to have a city council that upholds the rights of tax-payers, instead all indications point out that the council is pro-business. “We are not against development and progress but it should be done in an accountable way,” he said. ·anything that affects the residents. “However, the third ruling was amended 18 years ago, hence residents do not have a say if the development does not affect density or land use. “All we asked was for a chance to be heard,” he said. Ashok pointed out that Bukit Gasing bore many similarities to Bukit Antarabangsa such as underground piping. He fears the possibility of the Bukit Antarabangsa tragedy will befall them if hillslope developments in Bukit Gasing are given the green light. Resident G. Ong who has been residing in Bukit Gasing for the past six years, was jubilant with the judgment. “The environment should not be spoiled. “Think of others and not just of what goes in the pocket. We hope that whoever sits in the judgment can come to their senses,” she said. One resident remarked that “this is not the end of it”, implying that DBKL and the developers will pursue this matter and take it to the Federal Court. Fernandez, who is also the Petaling Jaya city councillor, pointed out the differences between Kuala Lumpur and Petaling Jaya. “Since 2008, there will be public hearings if there were objections to any developments in Petaling Jaya. “However according to DBKL, this right is limited in KL, unless there’s a change to density or land use. “Hopefully, this will signify a change where public participation is allowed in DBKL and I hope that this will be streamlined across the country whereby all neighbouring landowners have a right to be heard in any development taking place. “The people must be heard,” he said. Kuala Lumpur City Hall and a developer today failed to prevent 108 Bukit Gasing residents from challenging a development order by the Kuala Lumpur mayor pertaining to a hillslope development project in the area. Court of Appeal judge Zaleha Zahari and Mohd Hishamudin Mohd Yunus dismissed KL City Hall’s appeal in a 2-1 majority decision, with justice KN Segara dissenting. In an oral decision, justice Zaleha said after going through the submissions of both parties, the applicant’s appeal was dismissed. The residents claimed that the mayor had failed to take into account that they had a right under common law to be given due notice, and be given a chance to voice their opinions in the decision-making process of planning. KL City Hall and the developer, Gasing Meridian Sdn Bhd (GMSB), are appealing against the High Court decision on April 24, in granting leave for a judicial review to the residents to quash the mayor’s order. GMSB is the developer involved in the development of Sanctuary Ridge Kuala Lumpur City – a project to build 68 bungalows on a 15.5ha site in Bukit Gasing. Lawyers R Sivarasa and Derek Fernandez, appearing for the residents, told the media that the residents should have the right to voice their opinion as there might be landslides affecting the lives and property of those staying near the hill. Legal counsel for Bukit Gasing, YB Sivarasa Rasiah (supported by Mr. Derek Fernandez), opened his arguments by bringing the judges attention to the site of the proposed building. Explaining that 3 condos (Fraser, Cameron and Maxwell Towers, total 6 block), houses in Taman Gasing Indah are all in close proximity to the proposed development. In addition, there is a 23 million litre reservoir with a 2 meter diameter pipeline along boundary of the proposed development. Proposed development will be on steep hill slopes. The chronology of events was made to the court. He highlighted that the application for the 1st judicial review was submitted when it became clear that DBKL would ignore their concern for safety and had rejected a public hearing via the hand delivered letter of 31.1012.2007 from DBKL. This was despite the impression given at the 14.11.2007 meeting with Director of Planning KL (Tuan Haji Mahadi) that DBKL would respond to petitions for a public hearing. He highlighted that minutes of the 14.11.2007 (dated 21.11.2007) was provided to DBKL with request for detail of approval for sub-division of land. However, DBKL did not respond to repeated request for information. YB Sivarasa pointed out that the High Court, Honourable Judge Madam Lau Bee Lan, had given details of arguments by the parties and her reasons for granting extension of time in her written judgement. The residents only became aware of a DO (in the form of approval of sub-division of land on 2.10.2007) in affidavits from the developer dated 15.4.2008. He stated that residents could not file an application on verbal communication without having details. During exchanges between counsels and judges, the Honourable Datin Paduka Zaleha commented that the residents did not know a DO was given at the time suggested by the appellants. YB Sivarasa also confirmed his withdrawal of cross appeal against the dismissal of the 2nd judicial review on the DOs for Hoarding and Earthworks by the High Court. This was in the context that the Honourable Madam Lau Bee Lan’s written judgement had stated that these two DOs are consequential and purely administrative, resulting from DO for sub-division of land. With regard to locus standi, YB Sivarasa, highlighted various case histories and that the reasons for application for 1st judicial review are not “frivolous or vexatious”. He pointed out the High Court had considered the arguments presented at the inter partes hearing before grant of leave for judicial review. Note: The Honourable Judge Madam Lau Bee Lan’s written judgement had highlighted the contention between the parties on whether the Town and Country Planning (Amendment) Act 2001 (Act 1129) or the FT Planning Act (1982) with “1994 Rules” should apply. She concluded these are arguable issues. YB Sivarasa told the court that numerous guidelines in the Kuala Lumpur Structure Plan (KLSP) were breached in DBKL’s approval of DO to developer. In particular, Policy EN 6 that states “City Hall shall not permit development on hillside with slope that exceeds the allowable level, rules and regulations set by the Federal Government”. The Total Planning and Development Guidelines (2nd Edition) by Ministry of Housing and Local Government (Department of Town and Country Planning, Peninsular Malaysia) states under “Steep Slope Areas” that, “Construction is not permitted in areas on steep slopes (exceeding 25 degrees) “. In addition, there are common law reasons which were detailed in his submission in response to the appeals. He highlighted that the Appellants litigating the issues extension of time for leave and locus standi militate against views of Chief Justice in the recent Federal Court judgement of “Majilis Agama Islam Selangor v. Bong Boon Chuen. In closing responses, DBKL stated that the Kuala Lumpur Structure Plan is not a legal binding requirement when considering the development orders. Counsel for the developer reiterated the key points he had made. The Honourable Datin Paduka Zaleha, after consulting the other judges moved to adjourn the hearing and fixed 20th November 2009 (coming Friday) at 10:00am to deliver the court’s decision on the appeals. The hearing ended well after 5:00pm. Note: The “1994 Rules” is an amendment to the Planning (Development) Rules 1970, made by DBKL (under powers conferred by s 64 of FT Planning Act) after DBKL lost the case between of Datin Azizah v. Dewan Bandaraya Kuala Lumpur for failure to notify and hear objections from residents before granting development order. To put a long story short, although MBPJ has gazzetted the PJ side of Bukit Gasing as a green lung (for now), DBKL has decided to approve the KL side of Bukit Gasing for development.The development will consist of 68 bungalow lots on 38 acres on the KL side, stretching from the 23 million litre water reservoir down until nearby Gasing Indah and Pantai Dalam. Residents of Bukit Gasing have filed a court case against DBKL for refusing to hold a public hearing prior to approval of the project, and refusing to reveal technical data on the project. Yet the developer is rushing to start off some work before the court hearing on the 23rd April and before the opposition excos comes into full force. Once land is fully cleared, it will be too late and development has to proceed. We need the support of residents and the general public to stop this development before it is too late. We need financial funding to pay our lawyers and court expenses. Our long term battle includes getting a public hearing with DBKL, getting a stop work order, then proving the site is too dangerous for any development, reversing the approval for development, and finally gazzetting the site as a permanent green lung. We also need petition support, meaning your signatures and presence in our public petitions and activities. We need voluntary workers to volunteer their time and effort to organize efforts to campaign our cause. We need resources such as information and expertise that will support our cause – engineers, geologists, experts, politicians (we already got Hee Loy Sian, Edward Lee, Sivarasa and Elizabeth Wong, and Nurul, to support our cause and bring it up to higher authorities). I am a volunteer for the Save Bukit Gasing Joint Action Committee. I hope to be able to gather the support of my friends in whatever way to help Save Bukit Gasing. Please do contact me at 012-329 2626 or andyng555@gmail.com if you need to know more. I will be more than happy to explain further. Even if you cannot find a reason to object to the development, I hope you can help save the environment so that many people can still enjoy their morning walks up Bukit Gasing jungle trails. And let the monkeys and other animals have a place to live. Let there be some green left. For the lucky affluent (nothing against you guys) who are thinking of buying the property there, think again, the land may not be suitable to build on, and it might be decided that you may not be allowed to build anything there. Definitely a bad investment. And you do not want a 23 million litre water reservoir as your nearby neighbour. THE developer involved in the development of Sanctuary Ridge Kuala Lumpur City – a project to construct 68 bungalows on a 38-acre site in Bukit Gasing has started hoarding work at the perimeters of the development site. A spokesman from the company, Gasing Meridian Sdn Bhd, said the hoarding was being erected pursuant to approvals dated Oct 2, 2007 and Nov 16, 2007. “Hoarding is a barrier which is required before the start of any work involving construction, alteration, repair or demolition of buildings. “For safety reasons we strongly advise that the public refrain from any movements into the construction site,” he said, adding that those with children and/or pets were advised to keep away from the construction site at all times. The spokesman said that to facilitate hoarding, shrubs would be cleared to make way for the perimeter fencing. “To reduce the need to fell trees, we will hoard around the trees that fall on the pathway of the perimeter. This will increase the time and effort needed to complete the entire hoarding process. “As responsible developers – undertaking this effort voluntarily is necessary to reduce unnecessary felling. He added that the company had distributed newsletters to residents in the area informing them of the hoarding exercise. The Joint Action Committee of Bukit Gasing (JAC) and residents living in the area had recently gone to court to compel the Kuala Lumpur City Hall (DBKL) to hold a public hearing on the proposed development located on the KL side of Bukit Gasing. The residents also wanted to see the necessary papers, technical reports and studies on the development. They said that the project, which is located on hill slope, is dangerous and they feared for their safety. The spokesman however denied that the development is unsafe and was against regulations as they (developer) had studied the site in detail. He added that the Federal Territories Ministry’s Committee on the Sensitivity of the Environment had also independently reviewed the project. The committee comprises experts from Ikram (Public Works Institute of Malaysia), the Department of Geosciences and Mineral, Public Works Department, the Department of Environment, National Soil Erosion Research Centre and Minerals following which the committee issued its clearance for the project. The spokesman said that geology of the area was characterised by the Kenny Hill Formation, which has supported even high-rise buildings, including for two decades the condominium blocks in the vicinity. The project does not encroach on the reserve of the Syabas water tank, which contains five million gallons.